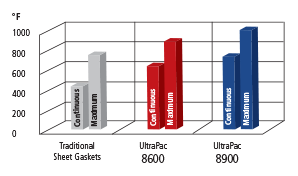 Outstanding temperature range compared with traditional sheet gaskets. 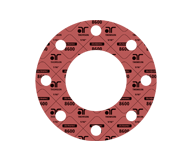 Chemical Compatibility: Resistant to a wider variety of chemicals and well-suited for steam service. 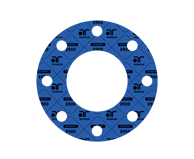 Exceptionally easy to handle: Highly flexible and easy to cut making it ideal for narrow flanges or hand cutting irregular gaskets. This increases productivity while minimizing waste. Hazard-Free: Produced using a chemical-free, water-based process which is Nitrosamine-free and environmentally-friendly. Anti-Stick Technology: Thomson Sure-Release™ Anti-Stick Technology for easy removal, even after long term service at high temperatures. Excellent General Service sheet with outstanding flexibility, improved chemical compatibility, and higher temperature range. Typical Service: Optimal versatility sheet ideal for steam, petroleum, hydrocarbons, most refrigerants and brake fluids. Excellent for higher temperatures/pressures and where superior chemical compatibility is preferred. Fire Safe, API 6FB certified. 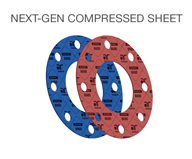 8900-FM is reinforced with Flexmet™ insert for greater pressure capability.